Hans Christian Andersen wrote this tale about a soldier who acquired a magical box which calls on three dogs to do this bidding (1835). A SOLDIER came marching along the high road: Left, right, left, right. He had his knapsack on his back, and a sword at his side; he had been to the wars, and was now returning home. As he walked on, he met a very frightful-looking old witch in the road. Her under-lip hung quite down on her breast, and she stopped and said, Good evening, soldier; you have a very fine sword, and a large knapsack, and you are a real soldier; so you shall have as much money as ever you like. Thank you, old witch, said the soldier. Do you see that large tree, said the witch, pointing to a tree which stood beside them. 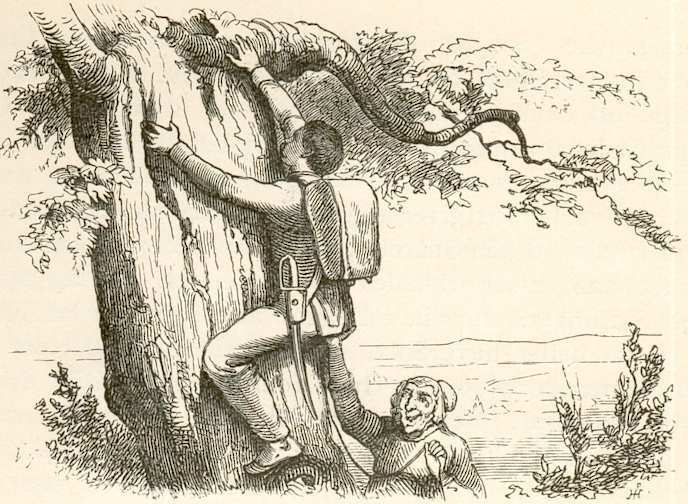 Well, it is quite hollow inside, and you must climb to the top, when you will see a hole, through which you can let yourself down into the tree to a great depth. I will tie a rope round your body, so that I can pull you up again when you call out to me. But what am I to do, down there in the tree? asked the soldier. Get money, she replied; for you must know that when you reach the ground under the tree, you will find yourself in a large hall, lighted up by three hundred lamps; you will then see three doors, which can be easily opened, for the keys are in all the locks. 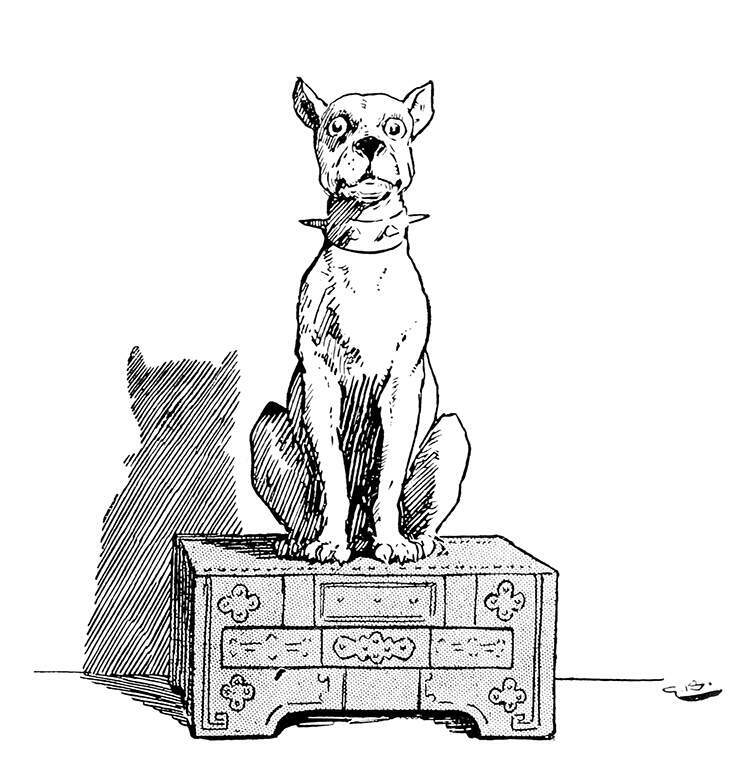 On entering the first of the chambers, to which these doors lead, you will see a large chest, standing in the middle of the floor, and upon it a dog seated, with a pair of eyes as large as teacups. But you need not be at all afraid of him; I will give you my blue checked apron, which you must spread upon the floor, and then boldly seize hold of the dog, and place him upon it. You can then open the chest, and take from it as many pence as you please, they are only copper pence; but if you would rather have silver money, you must go into the second chamber. Here you will find another dog, with eyes as big as mill-wheels; but do not let that trouble you. Place him upon my apron, and then take what money you please. If, however, you like gold best, enter the third chamber, where there is another chest full of it. The dog who sits on this chest is very dreadful; his eyes are as big as a tower, but do not mind him. If he also is placed upon my apron, he cannot hurt you, and you may take from the chest what gold you will. This is not a bad story, said the soldier; but what am I to give you, you old witch? for, of course, you do not mean to tell me all this for nothing. No, said the witch; but I do not ask for a single penny. Only promise to bring me an old tinder-box, which my grandmother left behind the last time she went down there. Very well; I promise. Now tie the rope round my body. Here it is, replied the witch; and here is my blue checked apron. As soon as the rope was tied, the soldier climbed up the tree, and let himself down through the hollow to the ground beneath; and here he found, as the witch had told him, a large hall, in which many hundred lamps were all burning. Then he opened the first door. Ah! there sat the dog, with the eyes as large as teacups, staring at him. You're a pretty fellow, said the soldier, seizing him, and placing him on the witch's apron, while he filled his pockets from the chest with as many pieces as they would hold. Then he closed the lid, seated the dog upon it again, and walked into another chamber, And, sure enough, there sat the dog with eyes as big as mill-wheels. You had better not look at me in that way, said the soldier; you will make your eyes water; and then he seated him also upon the apron, and opened the chest. But when he saw what a quantity of silver money it contained, he very quickly threw away all the coppers he had taken, and filled his pockets and his knapsack with nothing but silver. Good morning, said the soldier, touching his cap, for he had never seen such a dog in his life. But after looking at him more closely, he thought he had been civil enough, so he placed him on the floor, and opened the chest. Good gracious, what a quantity of gold there was! enough to buy all the sugar-sticks of the sweet-stuff women; all the tin soldiers, whips, and rocking-horses in the world, or even the whole town itself. There was, indeed, an immense quantity. So the soldier now threw away all the silver money he had taken, and filled his pockets and his knapsack with gold instead; and not only his pockets and his knapsack, but even his cap and boots, so that he could scarcely walk. He was really rich now; so he replaced the dog on the chest, closed the door, and called up through the tree, Now pull me out, you old witch. Have you got the tinder-box? asked the witch. No; I declare I quite forgot it. So he went back and fetched the tinderbox, and then the witch drew him up out of the tree, and he stood again in the high road, with his pockets, his knapsack, his cap, and his boots full of gold. What are you going to do with the tinder-box? asked the soldier. That is nothing to you, replied the witch; you have the money, now give me the tinder-box. I tell you what, said the soldier, if you don't tell me what you are going to do with it, I will draw my sword and cut off your head. The servant, who cleaned his boots, thought they certainly were a shabby pair to be worn by such a rich gentleman, for he had not yet bought any new ones. The next day, however, he procured some good clothes and proper boots, so that our soldier soon became known as a fine gentleman, and the people visited him, and told him all the wonders that were to be seen in the town, and of the kings beautiful daughter, the princess. Where can I see her? asked the soldier. She is not to be seen at all, they said; she lives in a large copper castle, surrounded by walls and towers. No one but the king himself can pass in or out, for there has been a prophecy that she will marry a common soldier, and the king cannot bear to think of such a marriage. I should like very much to see her, thought the soldier; but he could not obtain permission to do so. However, he passed a very pleasant time; went to the theatre, drove in the kings garden, and gave a great deal of money to the poor, which was very good of him; he remembered what it had been in olden times to be without a shilling. Now he was rich, had fine clothes, and many friends, who all declared he was a fine fellow and a real gentleman, and all this gratified him exceedingly. But his money would not last forever; and as he spent and gave away a great deal daily, and received none, he found himself at last with only two shillings left. So he was obliged to leave his elegant rooms, and live in a little garret under the roof, where he had to clean his own boots, and even mend them with a large needle. None of his friends came to see him, there were too many stairs to mount up. One dark evening, he had not even a penny to buy a candle; then all at once he remembered that there was a piece of candle stuck in the tinder-box, which he had brought from the old tree, into which the witch had helped him. He found the tinder-box, but no sooner had he struck a few sparks from the flint and steel, than the door flew open and the dog with eyes as big as teacups, whom he had seen while down in the tree, stood before him, and said, What orders, master? Hallo, said the soldier; well this is a pleasant tinder-box, if it brings me all I wish for. Bring me some money, said he to the dog. After a while he began to think it was very strange that no one could get a look at the princess. Every one says she is very beautiful, thought he to himself; but what is the use of that if she is to be shut up in a copper castle surrounded by so many towers. Can I by any means get to see her. Stop! where is my tinder-box? Then he struck a light, and in a moment the dog, with eyes as big as teacups, stood before him. It is midnight, said the soldier, yet I should very much like to see the princess, if only for a moment. The dog disappeared instantly, and before the soldier could even look round, he returned with the princess. She was lying on the dogs back asleep, and looked so lovely, that every one who saw her would know she was a real princess. The soldier could not help kissing her, true soldier as he was. Then the dog ran back with the princess; but in the morning, while at breakfast with the king and queen, she told them what a singular dream she had had during the night, of a dog and a soldier, that she had ridden on the dogs back, and been kissed by the soldier. That is a very pretty story, indeed, said the queen. So the next night one of the old ladies of the court was set to watch by the princess's bed, to discover whether it really was a dream, or what else it might be. Here it is, said the king, when they came to the first door with a cross on it. No, my dear husband, it must be that one, said the queen, pointing to a second door having a cross also. And here is one, and there is another! they all exclaimed; for there were crosses on all the doors in every direction. So they felt it would be useless to search any farther. But the queen was a very clever woman; she could do a great deal more than merely ride in a carriage. She took her large gold scissors, cut a piece of silk into squares, and made a neat little bag. This bag she filled with buckwheat flour, and tied it round the princess's neck; and then she cut a small hole in the bag, so that the flour might be scattered on the ground as the princess went along. During the night, the dog came again and carried the princess on his back, and ran with her to the soldier, who loved her very much, and wished that he had been a prince, so that he might have her for a wife. The dog did not observe how the flour ran out of the bag all the way from the castle wall to the soldiers house, and even up to the window, where he had climbed with the princess. Therefore in the morning the king and queen found out where their daughter had been, and the soldier was taken up and put in prison. Oh, how dark and disagreeable it was as he sat there, and the people said to him, To-morrow you will be hanged. It was not very pleasant news, and besides, he had left the tinder-box at the inn. In the morning he could see through the iron grating of the little window how the people were hastening out of the town to see him hanged; he heard the drums beating, and saw the soldiers marching. Every one ran out to look at them. and a shoemakers boy, with a leather apron and slippers on, galloped by so fast, that one of his slippers flew off and struck against the wall where the soldier sat looking through the iron grating. Hallo, you shoemakers boy, you need not be in such a hurry, cried the soldier to him. There will be nothing to see till I come; but if you will run to the house where I have been living, and bring me my tinder-box, you shall have four shillings, but you must put your best foot foremost. The shoemakers boy liked the idea of getting the four shillings, so he ran very fast and fetched the tinder-box, and gave it to the soldier. And now we shall see what happened. Outside the town a large gibbet had been erected, round which stood the soldiers and several thousands of people. The king and the queen sat on splendid thrones opposite to the judges and the whole council. The soldier already stood on the ladder; but as they were about to place the rope around his neck, he said that an innocent request was often granted to a poor criminal before he suffered death. He wished very much to smoke a pipe, as it would be the last pipe he should ever smoke in the world. The king could not refuse this request, so the soldier took his tinder-box, and struck fire, once, twice, thrice, and there in a moment stood all the dogs;the one with eyes as big as teacups, the one with eyes as large as mill-wheels, and the third, whose eyes were like towers. Help me now, that I may not be hanged, cried the soldier. I will not be touched, said the king. But the largest dog seized him, as well as the queen, and threw them after the others. Then the soldiers and all the people were afraid, and cried, Good soldier, you shall be our king, and you shall marry the beautiful princess. So they placed the soldier in the kings carriage, and the three dogs ran on in front and cried Hurrah! and the little boys whistled through their fingers, and the soldiers presented arms. The princess came out of the copper castle, and became queen, which was very pleasing to her. The wedding festivities lasted a whole week, and the dogs sat at the table, and stared with all their eyes. Add The Tinder-Box to your own personal library.